Last month at the Schneider Electric Innovation Summit in Paris, I had the opportunity to work with an amazing group of panelists to address the question “How is Digital Impacting the Human Experience in Commercial Real Estate?” And the answer was clear. Digital is impacting commercial real estate in ways we could only imagine just a few years ago. Before jumping into the debate, we discussed some of the unprecedented transformations happening in the real estate industry that are driving change. First, the industry is globalizing. The old adage, ‘all real estate is local’ doesn’t quite hold true any longer as new global standards begin to emerge. Meanwhile more smart building technologies are taking hold such as IoT-enabled buildings which are becoming strong value drivers for developers. Next data-driven decision-making using technologies such as AI are making buildings more intuitive for occupants and building operators. Also, developers and real estate professionals are continuously working to make their buildings more sustainable. And lastly, companies are using their commercial real estate as a way to compete for and retain the best talent. Employees are looking for workspace dynamics that allow for activity-based working and hyper-customizable spaces and amenities. We call this the war for talent. At Schneider Electric, we offer solutions in three primary areas that address these challenges. Sustainable Development: First, we help real estate professionals meet the requirements of sustainable building certifications and reporting, and we support them in demonstrating effective governance. Operational Flexibility: We also help with solutions for operational flexibility to maximize net operating income (NOI) by enabling smart building efficiency and agility to attract and retain new tenants. Enhanced Human Experience: To help improve the human experience in real estate, we help our real estate customers create spaces that foster engagement, occupant health and safety, and promote productivity. 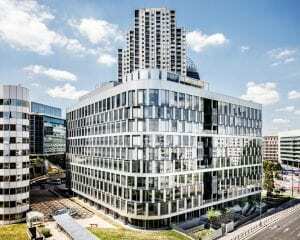 The Sogeprom headquarters building, Ampere e+, in Paris is a real life case of digital impacting the human experience in real estate. Not only did the panelists have ideas about the future of work and how big data will change the way we interact with our workspaces, they are utilizing many of these technologies today. Mr. Christophe Dumas, Head of Innovation and Technology for Sogeprom, the real estate division of Societe Generale, presented his flagship Paris headquarters building, Ampere e+, to the audience. For Ampere e+, Sogeprom wanted to showcase their capabilities as a real estate development company while creating a space that would attract and retain millennial talent and improve space utilization. The result is a showcase building that combines sustainability with an amazing occupant building experience. It is the first refurbished building in Europe to receive the “Cradle to Cradle Certification” related to the circular economy and the winner to the 2017 Green Solutions Award in the Smart Building Category at the COP23 against 17 international competitors. Buildings like Ampere e+ are truly impacting the human experience in real estate with their use of digitization. At Ampere e+, all building occupants are provided with a mobile device that enables employees to select their parking area, gain access into the parking garage and building, shows options for open space seating and meeting rooms and even allows them to alert the facility team if there is an issue in the building. Schneider Electric technology is deployed throughout the building starting with EcoStruxure Building Operation building management system and SmartX IP controllers. Even the custom mobile application which allows building occupants to control lighting and blinds, manage temperature, check for parking and meeting room availability, café wait times and more was co-developed by Schneider Electric. Digital is impacting the human experience in bold ways at Ampere e+. For more on commercial real estate and trends in buildings, consider following the Buildings Re-Invented blog series.